Features :High-Definition High Bass Speakers :- The Ape has a High-Definition 3W speaker with enhanc..
- The Ape has a High-Definition 3W speaker with enhanced sound drivers that take your music listening experience on to the next level . - The surround bass sound provides you with a complete magically music experience . - The bass is strong enough to give any song a boost and make it better and enjoyable without distorting the tune and sound . - Play your favourite tracks with multiple connectivity options. The Ape has Bluetooth v2.1 + EDR for wireless connection with your mobile phones or laptops or any other streaming device . - You can also use the AUX Jack provided along to connect via AUX to any audio device or mobile phone with the Ape and keep jamming . - The Promate Ape features a button required to make your music navigation a breeze . - The Ape features a single Button to Play and Pause the Music or Audio . - The same button if long pressed switches on and off the Ape . - Avoid Button Clutter with Just One Single Button to make navigation and control a breeze . - The Ape has a magnetic Speaker Head which can be separated from the Phone Holder and can be used as a Stand-Alone Speaker which is designed as a cute Ape . - The mobile stand can still be used without the speaker's head as a normal mobile holder . - The Ape is Shaped like a cool Monkey with cute ears and Sun-Glasses . - The build quality and looks of the speakers make it an instant favourite for kids and adults as well . - The Ape is designed while keeping in mind the kids and their play habits and choices . - The Ape is a complete party animal and to make it more party and kids friendly the Build-Quality of Ape is High . - The Ape is durable enough to withstand small drops and dents . - Play your favourite tracks without interruption for up to 3 hours with the 400mAh rechargeable lithium polymer battery . - With the Promate Ape, you will never run out of fun and music . - The Ape comes with LED Indicators to show various functions . - The Red-Light indicates charging (i.e. whether the device is being charged or not) and Bluetooth connectivity of the device is indicated by the blue LED . - The Thumbs-Up hands of the Ape are designed to hold mobile phones in its grip so that you can enjoy movies, videos or simply browse through your phone while the audio/ music is streaming through the speaker's head without holding your phone . - The Mobile Holder can hold phones from 6 cm up to 20 cm which includes most of the large phones available in the market . - Made of high-grade environmental and non-toxic TPU materials, sincerely care for your health . - You can stretch it to an enough wide span (less than 8 inches), compatible with most devices . - This cell phone holder is durable for thousands of times of stretch or warp, longer lasting and good in toughness . - With the spring steel into the TPU holder, you can bend it to the beginning state . 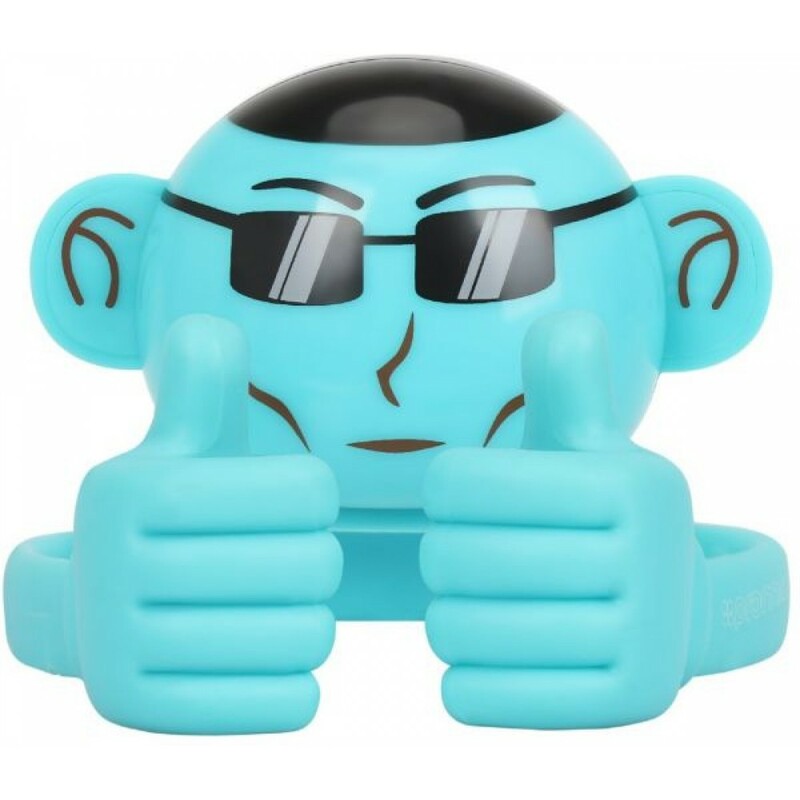 - Easy to adjust the viewing angle of your phone or tablet, by sliding the cute TPU hands up and down, support both vertical and horizontal viewing . - Absolutely free your hands! No need to hold the heavy device all the time, just watch movies, read the news, play games, comfortably use Facetime! No matter you are in the open air, the office, the kitchen, at home or in the bed, this thumb-up phone stand would hold your devices steadily, make your digital life much more convenient! Soft TPU hands protect your device from scratches and sliding . - The Promate Wireless Speaker is the perfect companion for all your devices including iPhones, phones, smartphones, laptops, and Bluetooth dongles . - It gives you the flexibility to share your speaker with all your devices. Smartphone Stand is especially designed for devices from 6cm -20cm, E-readers and Tablets Like, Samsung Galaxy Tab series, Motorola, LG, HTC, Google Pixel Nexus, Samsung Galaxy Note 8 / S9 / S9+ / S8 / S7 / S6 / Note /Edge series, iPhone X / 8 / 7 / 7 Plus / 6 / 6 Plus / 6s / 6s Plus / SE / 5 /5s, iPad series like iPad Pro 10.5, iPad Air 2, iPad Air, iPad 9.7, iPad mini 4 / 3 / 2 / 1 . - Bluetooth Version : v2.1 + EDR . - Bluetooth Chipset : BK8000L . - Bluetooth Frequency : 2.4GHz . - Bluetooth Profiles : A2DP . - Battery Type : Li-Ion . - Battery Capacity : 400mAh . - Power Input : 5V, 1A . - Speaker Output : 3W . - Impedance : 4 Ω . - Operating Distance : 10m . - Music Playback Time : 3 Hours .